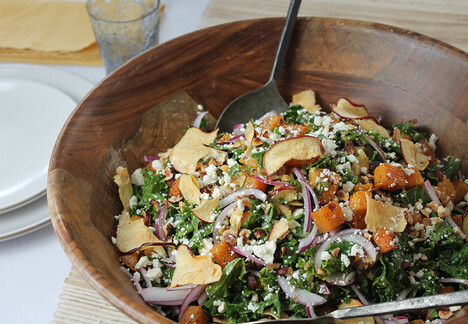 A festive cold weather salad filled with the sweetness of maple syrup and seasonal goodies like butternut squash, hazlenuts and apple chips. In a medium bowl, combine butternut squash, salt, cinnamon and nutmeg. Place on a baking sheet and bake for 15-20 minutes. Transfer to a bowl and refrigerate. For the maple cider vinaigrette: In a medium bowl, whisk together apple cider vinegar, maple syrup, mustard, salt and pepper. Slowly whisk in oil until emulsified. In a large bowl, toss together all ingredients. Serve in a large bowl garnished with extra toppings.